Chromogenic Coliform Agar (CCA) conforms to the ISO 9308-1 guidelines for the detection, enumeration and isolation of coliforms and more specifically Escherichia coli in water samples by the membrane-filtration technique. The colonial differentiation is provided by the chromogenic substrates, Salmon-GAL and X-glucuronide. Salmon-GAL is used for the detection of β-D-galactosidase enzymatic activity. X-glucuronide is used for the detection of β-D-Glucoronidase enzymatic activity. β-D-galactosidase, expressed by all coliforms, cleaves the Salmon-GAL substrate and producing red/pink coloured colonies. 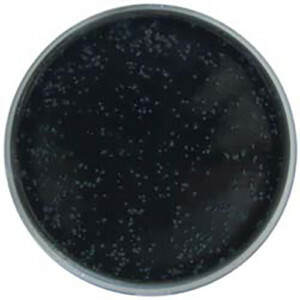 Unlike other coliforms, Escherichia coli leaves both Salmon-GAL and X-glucuronide producing a violet/blue coloured colonies. Tryptophan is used to increase detection reliability by improving the indole reaction. The peptones, sodium pyruvate and sorbitol support bacterial growth and simple recovery of sub-lethal thermally injured coliforms. Sodium di-hydrogen phosphate and di-sodium hydrogen phosphate phosphate buffer the medium and sodium chloride is used to achieve osmotic balance. The selectivity is attained by the addition of Tergitol® 7 as it inhibits the growth of Gram positive bacteria.